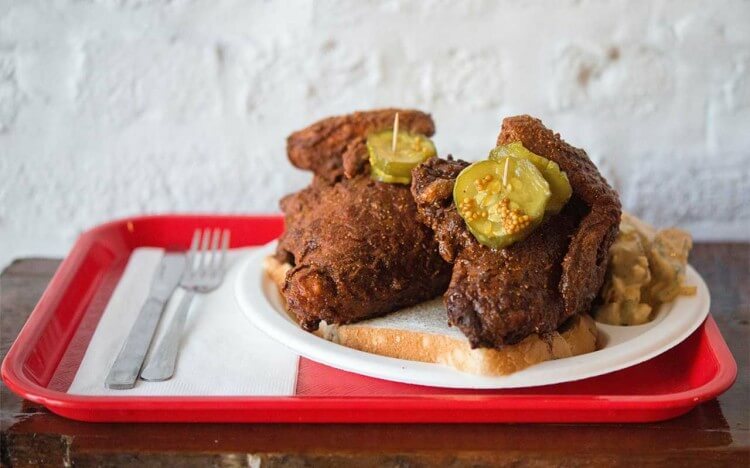 If you’re looking for some authentic Nashville hot chicken, then look no further than Hattie B’s. While this chicken trend was once hyper-local, this no-frills joint has put it on the map due to its spicy deliciousness. Whether you want something with no heat or you want tempt fate and test the resilience of your taste buds with their “Shut the Cluck Up” extra spicy style, this place is definitely the place to try some world-famous chicken. Don’t forget to order a few classic southern sides like black eyed pea salad, baked beans, coleslaw, and fries. But, be prepared to wait an hour or two during the lunch rush – because everyone wants a taste of this place. Starting as a humble food truck, Biscuit Love has transformed into a full-scale restaurant and Nashville staple. Owned by a husband and wife team, this playful and locally-sourced southern brunch spot has become popular with locals – with two new locations even opening up. If you want the true original experience, visit their flagship brick-and mortar location in the trendy neighborhood of the Gulch for some good old fashioned breakfast options. While the menu includes everything from bonuts (donuts made with biscuit dough) to burgers to grits – the biscuits are where the magic truly is. We recommend trying the “Eat Nasty,” which features their famous biscuits, boneless fried chicken, aged cheddar, and some hearty sausage gravy. James Beard award-winning Chef Sean Brock has declared that any ingredient coming into his restaurant better be from the south, and only the south. He says that it’s not about southern flavors, but rather exploring the reality of southern food. House-pickling, juicy heirloom tomatoes and charcuterie are all staples at Husk. With a twice-daily changing menu that is to-die for, the list of reservations looks like the society pages of a glossy magazine, with celebrities like Darius Rucker and the Zac Brown Band frequenting this hot spot. The people of Nashville love the Pancake Pantry – and you can see it for yourself as the line wraps around the building each morning. Since 1961, this mom-and-pop cultural hangout has been whipping up 23 varieties of pancakes from scratch every morning starting at 6 AM on the dot. The family has been making trips to Great Smoky Mountains for fresh-milled Tennessee flour for generations as the basis for their mouthwatering secret recipes. This is a bucket list item for any foodie visiting the city. Located in the restored historic Melrose Theater, Sinema Restaurant + Bar takes classic American dishes and makes you fall in love with them again by mixing them up a bit like the scallops with black garlic brown butter and spinach orzotto. This culinary hot spot has received national praise from outlets like Eater, Bon Appetit, Tasting Table, Zagat, Thrillist, Southern Living, and Food Network. Inside you’ll find a timeless menu, as well as screens playing classic movies and heavy drapes that pay homage to its original host. So just grab a cocktail or enjoy a full steak house dining experience in this unique venue. This fun and whimsical hot dog food truck is based out of a bright yellow VW bus. This “full service weenery” has an extensive menu of different hot dogs with toppings like pimento cheese, mac and cheese, hashbrown casserole, and southern slaw. Served on your choice of beef, turkey, or veggie hot dogs (or a bratwurst for an extra dollar) – I Dream of Weenie has something to fit everyone’s dietary restrictions and palette. Home of the west-Tennessee whole hog BBQ, where “pig is king,” it’s no wonder that Martin’s Bar-B-Que Joint is always packed. The delicious smell of roasting meat from the smoker pit tantalizes the senses and will make anyone want to throw their diet right out the window. Martin’s has some of the best BBQ that you’ll find in Nashville due their 24 roasting of a 200 pound pig and a secret blend of spices to create that perfect bite of pork. Plus, with a backyard beer garden it’s the perfect place to hang out with friends and family.